LetsGoPens.com • View topic - New iPhone coming..
shmenguin wrote: My phone came yesterday. Going from a 3GS to a 5 is ridiculous. I can't believe the difference. I just restored from my iCloud backup. Letang Is The Truth wrote: what is the 10pm deal? At 10pm, the apple stores update their inventories online, and you can reserve one for next day in-store pickup. So basically go online at 9:55, put the iPhone in your cart and enter in all of your info. Then at around 9:58 start checking the stores for availability via your zip code. If it is not available, close the store lookup window and keep trying until around 10:05. If you don't get one by 10:05 you try the next day. I tried this for about 5 days until South Hills apple store had one. Last Thursday night is when I snagged it, every store in Pittsburgh had the model I was looking for (64 GB white). I was seeing lots of stores though that had them during the week, especially in Ohio and DC. For some reason my pittsburgh zip code brings up the DC stores as well. So in other words, I got my iPhone before my wife who just got hers yesterday, and she ordered it like 2 days after the start of pre-orders. Also, you don't actually reserve the phone until you complete the checkout, so have your CC handy. Even if you just use the CC on file, they make you re-enter in your 3 digit code thing. So its like the capitals? Claims its arrived but you still have the playoffs to go. I've had the 5 for about tw days now and absolutely love it. The speed is unreal. Quick question though, has anyone noticed a slight green tint at the bottom of the lock screen? It goes away once unlocked. Odd. Also, if you tap slightly on the back, do you hear a rattle? I'm trying to decide what to do with my iPhone 4 now that I have the 5. Anybody here jailbreak? I'm thinking that might be fun. Sell it? Boring. I could just use it as an iPod. FYI I sold a iphone 4 32gb with broken screen for $225 on ebay, and a 16gb with broken screen for $125. there was an ios update waiting for me this morning. im sans droid right now waiting on a new battery so i popped my sim into my old iphone 3g. wooooooow its amazing how far we've come in phone technology in 4 years. nocera wrote: I've had the 5 for about tw days now and absolutely love it. The speed is unreal. Quick question though, has anyone noticed a slight green tint at the bottom of the lock screen? It goes away once unlocked. Odd. I've noticed this...I've seen speculation it's something in the camera. It doesn't seem to effect my pictures....they look great. I just sold my 4 to a friend for 60 bucks. I figured I really didn't need it. Is that a decent price for both parties? how much memory and was it fully functional? prob could have gotten $150 if 16gb and works. nocera wrote: I just sold my 4 to a friend for 60 bucks. I figured I really didn't need it. Is that a decent price for both parties? more than generous, considering you can get a hundo+ for it from CL. like i said, i sold a 16gb with cracked screen for a buck 25 on ebay. D'oh. Oh well, it's probably easier to sell to a friend then go through Craigslist. Just get the free one. I'm not an advocate for either platform - despite having an iPhone - but there's no reason to spend $100, when you can get a perfectly usable one for free. It's not like the 4S is 4G in enabled; if that's your thing, you have to go the 5....4G is nice to have, I'm sure, but 3G is very usable. I'd go with the 5 if it was me and the money wasn't a huge issue; you're going to have it for 2 years. There ya go. 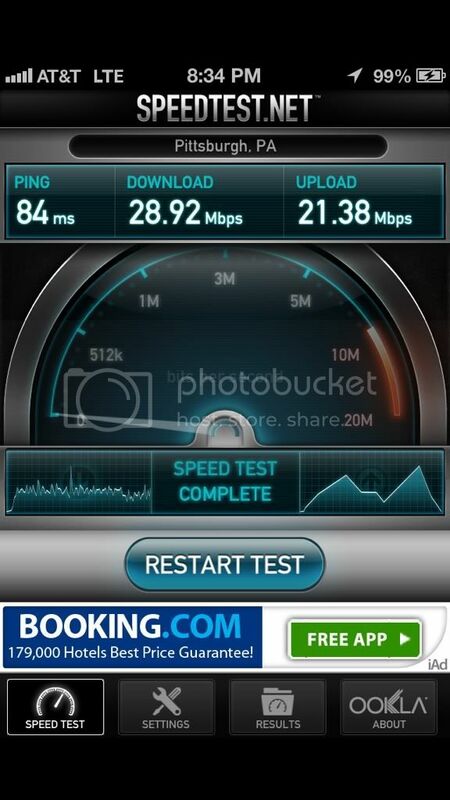 Don't worry about any of the "4G" talk if you're in the Pittsburgh area. Pittsburgh does not have 4G in place and won't for a quite a while so don't listen to any **** they might try to feed you on that... I probably go 4S just because I love siri, but the 4 for free isn't a bad option either. Thanks. I have 4G on my droid now, and really don't notice too much of a difference. I work in Pittsburgh, but havent really had too much problem up there either, I thought PGH had 4G by now?